We just moved from a two-bedroom duplex with an attached garage and a full basement to a two-bedroom apartment. One of the biggest space losses was in the kitchen. The kitchen here is very nice, but we're down several cabinets and, of course, we've lost counter space. So we've had to get creative with our storage options. For instance, we had all these utensils and nowhere to put them. 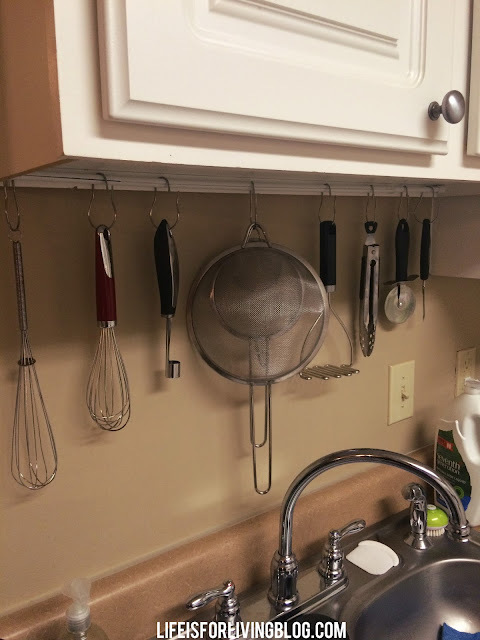 I scoured Pinterest and found several ideas for mounting hooks into walls/cabinets, but with this being an apartment, I didn't want to go drilling holes everywhere. That's when I had the brilliant idea to rig up a tool-free tension rod and hook system. I already had this tension rod that I'd ordered from Amazon a couple of years ago for my office at Cleburne County High School, and it worked wonderfully. I mounted it in the space below the upper cabinets with no problems at all. In fact, it took like thirty seconds. The hardest part was finding the right hooks to hang my utensils and miscellaneous kitchen gadgetry from. 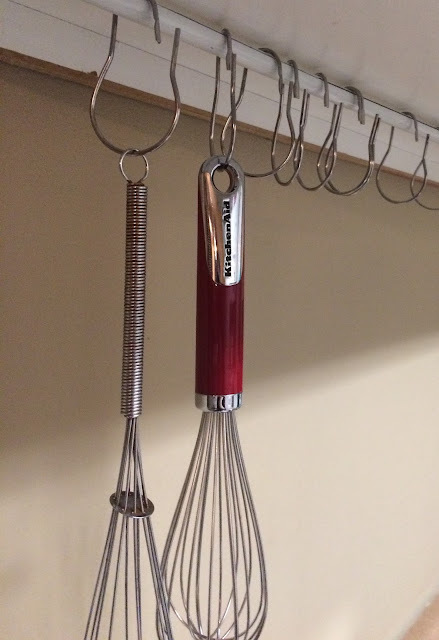 We got these S-hooks at Lowe's and thought they'd be perfect. Sadly, they were not. The openings were too narrow to fit around the tension rod, and they were suprisingly heavy and bulky. So. I searched all over town. 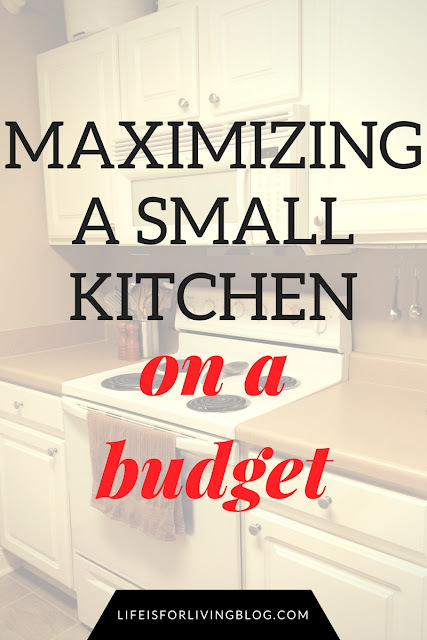 Home Depot, Walmart, Target, Bed, Bath, and Beyond, Ross, Marshall's, TJMaxx... I couldn't believe how complicated this was getting. Everything that would have worked was ridiculously expensive. 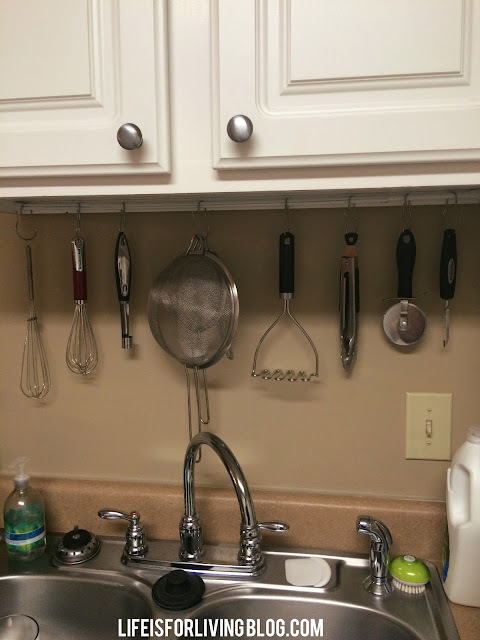 The best option we found were these cheapo shower hooks from Walmart. They fit onto the rod easily and they're thin enough to blend in aesthetically and not get in the way of anything. The clasps are kind of annoying to deal with, but we've just been leaving them open all the time, which has been working well. 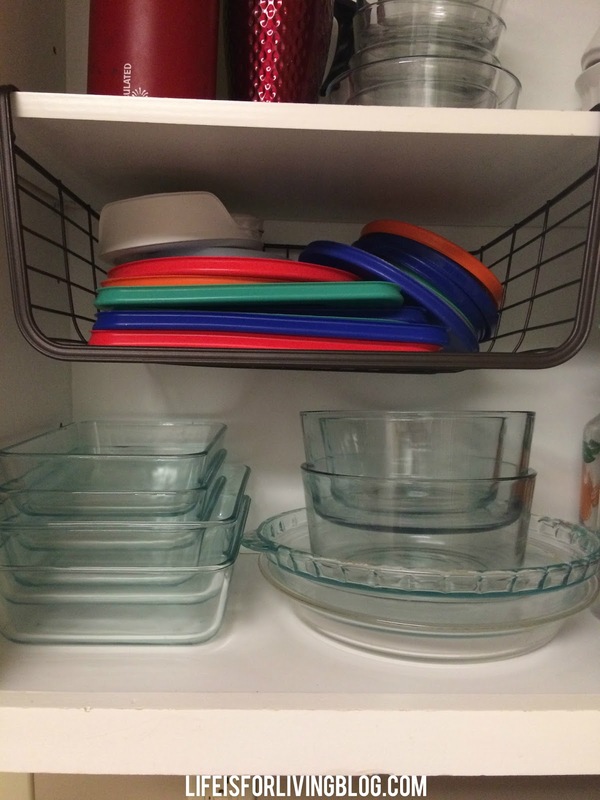 Another problem we faced in our smaller kitchen rested with our Pyrex dishes. Oh, how we love Pyrex. We try to avoid plastic, so we have a ton of small glass Pyrex containers for easily portable lunches and snacks. But storing these things, with all their lids, is a pain. It doesn't look too bad in the photo, but know that any time anything is moved in there, all those lids are avalanching with it. The solution? Check out this handy under-shelf basket I found at Ross for only $4.99! The ones similar to this that Target had were over $20 each, so that was quite a steal. You can't beat $4.99 at Ross Dress for Less, but I did find something comparable on Amazon for your reference. I love this little basket, and I'd buy one of these for every cabinet if Ross only had more. 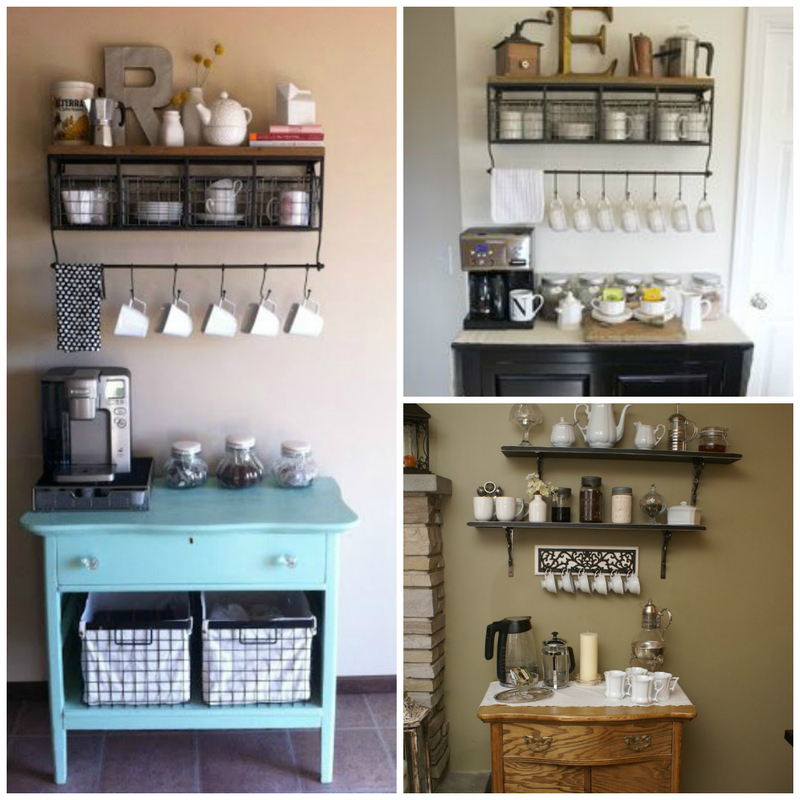 One more small-kitchen conundrum we've solved was with our coffee/tea bar. Now. The husband and I have coffee shop dreams. We've gotten pretty fancy with our at-home coffee and tea, and we've acquired quite a collection of accessories: a traditional coffee maker, an electric kettle, French press, coffee grinder, milk frother, stovetop espresso maker... Plus the actual coffee beans themselves as well as a varied assortment of loose leaf teas. All those things take up a ton of space. See? All that would have eaten up so much counter space. 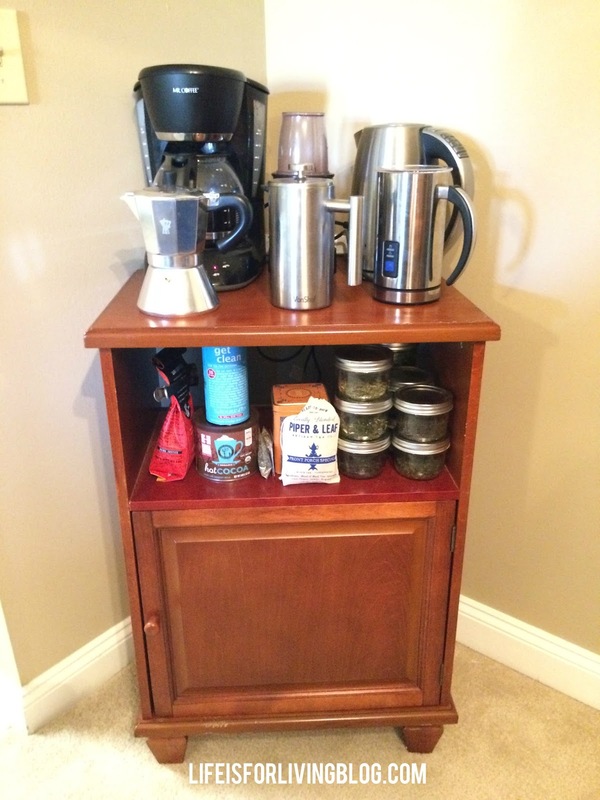 We got a good deal on this used cabinet in Kirksville, and it's perfect in our small home because it easily fits in a corner. Since there was no room in the actual kitchen, we placed it in the corner of our adjacent dining area. I used the bottom for my cookbooks. Probably not the best utilization of space here, but I haven't figured out another place to store them. 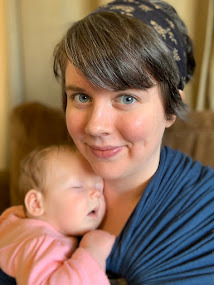 Everything in the apartment still feels like a work-in-progress, but these creative choices have really helped us to maximize the space we have. What are some ways you've stretched a small kitchen to its full potential? Share in the comments! All are great ideas! I'm really loving that under the shelf basket. Super cute and great utilization of space!